Whatsapp has been introduced a new feature Delete for everyone, Now you can delete your sent messages from receipt chat box. This may happen to everyone that you sent message to wrong chat and couldn’t help it. Now you can delete your sent messages from receipt chat box. This may happen to everyone that you sent message to wrong chat and couldn’t help it. WhatsApp new feature “delete for everyone” is especially addressing these kinds of mistakes. This feature allows sender to delete his sent message from everyone’s inbox. This feature not only use for individual inbox but also for group chats. * WhatsApp Push Notification Problems/Solutions. Whenever messages are sent to wrong chat or may contain wrong content or mistake, this feature will help to delete your message from receipt inbox. All updated versions of WhatsApp at all platforms, such as iPhone, windows phone and Android has this “Delete for Everyone” feature. This is latest feature of WhatsApp in prolonged features of WhatsApp. The commonly used WhatsApp smartphone app introduced this incredible feature to gain more value from their users those are facing this problem in regular conversation and this is bothering them too much. * Top Trending Post: Are you looking for wearable smart phones? To get this feature of WhatsApp it is necessary to have latest version of WhatsApp on both phones; sender and recipient. By downloading latest version or updating the old version, you can have this amazing feature on your WhatsApp. * Related Post: WhatsApp calling feature. Tap on trash/delete icon on display. The dialogue box will appear having the new option Delete for Everyone. When you select the ‘Delete for everyone’ option from dialogue box, the sent message will be switched with "You deleted this message" in both chat box; yours as well as the recipient. 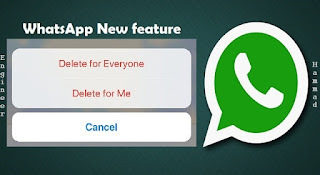 If the recipient doesn’t have the latest version of WhatsApp, you can’t use this feature in that case and the message may be seen by the receiver after deletion or if messages were not deleted. WhatsApp says that to use this feature you must be speedy user. As this feature ‘Delete for everyone’ can only be used within seven minutes of sending. Once seven minutes have passed, now you can’t avail this feature. * Do you know about world's lightest smartphone? WhatsApp also replaced the regular delete option with ‘delete for me’. This will work as the regular delete option does; deleting the messages and other content from own screen. All sent or received messages are not affected on the receiver end and they can see all messages as before. There is no change in this option’s working except the change in name. This features works in the same way: to delete more than one message at once, you need to select all those message and tap delete icon and then select the ‘delete for me’ option. Now the name ‘Delete for me’ is clearly telling that these messages will only be deleted from your screen and not from others’ screen. More: How to buy Memory Card for your Mobile phone?